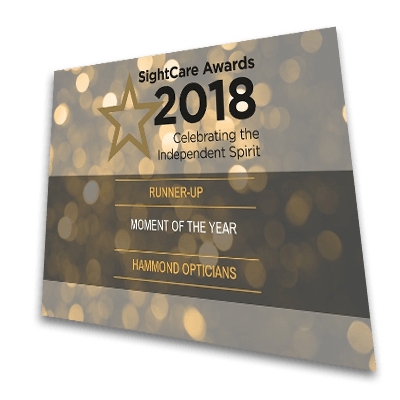 We are thrilled to announce that Hammond Opticians were nominated for ‘Moment of the Year’ at the inaugural Sight Care Awards in September 2018. This is a prestigious nationwide award which reflects how an optical practice can make a significant positive difference to the life and well-being of a client. The judging panel commented that the entries were tremendous and all the team at Hammond Opticians were very proud to be selected as the runner up for the award! The award nomination was based on a particular moment where we went above and beyond our usual day-to-day customer service experience as an opticians. In our case the nomination involved a patient that we helped with a difficult (non-optical) medical situation which followed a home emergency. We ensured the patient was taken care of, delivered their spectacles and helped with some day-to-day tasks until they were able to get back on their feet again. At the annual Sight Care Conference held in Telford this September, four members of our team attended; Deven, Rina, Debby and Anita (along with Hammond the Hamster). As part of the event the team took time away from their busy day-to-day work in the practice to focus on two days of intensive workshops. This enabled us to keep up to date with the latest lens and frame developments and to share ideas with our peers in the industry. Debby and Rina attended workshops focusing on Frame Styling so they can help our clients to decide which frames work best for their face shapes and colouring. Deven attended a Business Ideas session and Anita went to the Social Media workshop. We were also treated to some lovely Green & Blacks chocolates courtesy of the CEO Jo Fairley, who was the closing speaker for the conference and the presenter of the awards.